These are the words of the 8th Amendment of the Irish Constitution written into Irish law in 1983. Irish law currently safeguards the right to life of both mothers and their babies. Unfortunately, a push to repeal this Amendment has led to a referendum in Ireland. The vote will occur on May 25th. Naturally, the greedy abortion industry is spreading half-truths and no-truths to promote a “Yes” vote, repealing the 8th Amendment and legalizing abortion in Ireland. Mainstream media is playing its part to help with this promotion by providing polls meant to discourage “No” voters—think of the wildly erroneous polls from the last US presidential election for president—and spread the idea that abortion is good for the freedom and well-being of women. Sadly, even the Irish band U2 has announced its support of legalizing abortion in Ireland. This is no time to sit by idly and passively watch what happens. Do not listen to the abortion industry. Do not listen to mainstream media. Do not listen to U2 (pun intended—I never cared much for the band’s music anyway; the music of the Cranberries is much better, in my opinion). 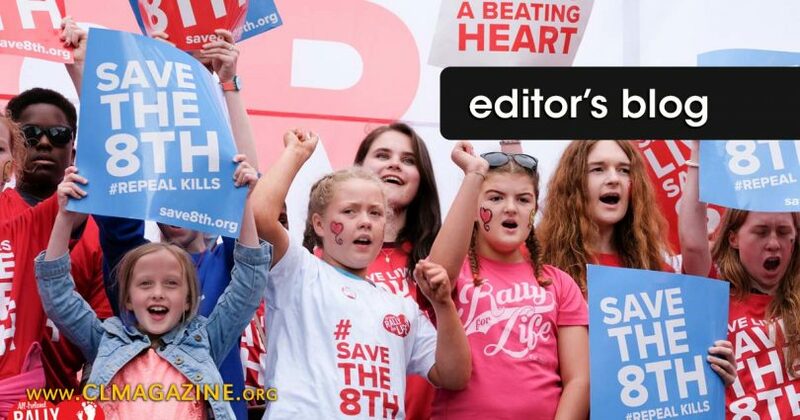 Join American Life League, which has launched a social media campaign to spread awareness as well as support and encourage the Irish to vote NO to a repeal that would hand countless innocent babies over to death. Remember the words of Shelton Smith regarding our country: “Abortion is still just as wrong today as it was the first day of January 1973.” As we continue to fight the horror of legalized abortion in our own country, let’s help the Irish keep abortion illegal in theirs. Check out American Life League’s Facebook and Twitter. There you will find many memes to like and share from now until May 25th. Thank you for standing up for every human being’s life.